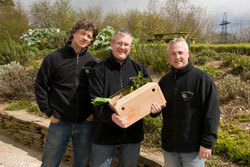 Riverford Organic Vegetables is a family owned business and appeared in the Sunday Times 2007 Fast Track 100 list as a company with one of the fastest scales of growth. The company launched 22 years ago, with one man a tractors and three acres of lannd. Today there are four farms and 350 members of staff. Riverford is committed to low food miles, local employment and supporting local farmers.